Higher education institutions have been profoundly reshaped by processes associated with neoliberalism. In this chapter, Larsen outlines the ways in which Denmark has ushered in market-driven reforms to the Danish higher education system to enhance their institutional competitiveness over the past 30 years. 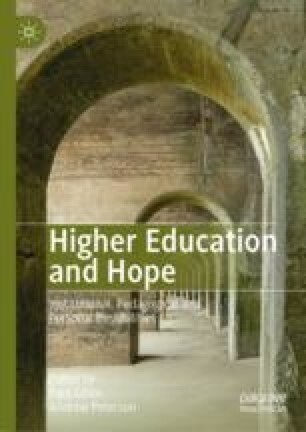 Research on the impacts of neoliberal higher education reforms on faculty is reviewed and the author discusses her experiences (at a Canadian university) with market-driven, accountability reforms. The chapter shifts direction and provides the reader with an overview of the concept of hygge, an idealized Danish term that has connotations of coziness, safety, friendliness, and intimacy. Larsen recounts her experiences as a Canadian academic on sabbatical at a Danish university in 2017, illustrating the ways in which she experienced hygge in the Danish university setting. In the final section of the chapter, Larsen argues that hygge can be viewed as a retreat from the individualism, competition, market stratification and other challenges associated with neoliberalism. Hygge marks out the boundaries between the cold and heartless market-place and the warm and cozy home, and despite critiques that is instantiates exclusions, hygge offers hope to resist the alienation associated with neoliberalism and provide an alternative ethos for close and safe social relations within academia. Anonymous Academic. (2018, April 27). I Thought US Universities Were Driven by Profit—Until I Moved to the UK (Higher Education Network). Available at https://www.theguardian.com/higher-education-network/2018/apr/27/i-thought-us-universities-were-driven-by-profit-until-i-moved-to-the-uk?CMP=Share_iOSApp_Other. Howell, J. P., & Sundberg, T. (2015). Towards an Affective Geopolitics. Environ Space, Place, 7, 97–120. https://doi.org/10.5840/esplace20157213. Lim, M. A., & Williams Øerberg, J. (2017). Active Instruments: On the Use of University Rankings in Developing National Systems of Higher Education. Policy Reviews in Higher Education, 1, 91–108. https://doi.org/10.1080/23322969.2016.1236351. Linnet, J. T. (2011). Money Can’t Buy Me Hygge: Danish Middle-Class Consumption, Egalitarianism, and the Sanctity of Inner Space. Social Analysis, 55, 21–44. https://doi.org/10.3167/sa.2011.550202. Lytken, M. (2013). The Danish School of Interior Architecture: A Visionary Functionalist, a Visionary Aesthete, and Their Women Students. Journal of Interior Design, 38, 1–19. https://doi.org/10.1111/joid.12012. Vingaard Johansen, U., Knudsen, F. B., Engelbrecht Kristoffersen, C., Stellfeld Rasmussen, J., Saaby Steffen, E., & Sund, K. J. (2017). Political Discourse on Higher Education in Denmark: From Enlightened Citizen to Homo Economicus. Studies in High Education, 42, 264–277. https://doi.org/10.1080/03075079.2015.1045477. Whelan, A. (2015). Academic Critique of Neoliberal Academia. Sites: A Journal of Social Anthropology and Cultural Studies, 12, 130–152. https://doi.org/10.11157/sites-vol12iss1id258.